The following is an excerpt from the book Lulu in the Sky: A Daughter of Cambodia Finds Love, Healing, and Double Happiness by Loung Ung. Copyright (c) 2012 by Loung Ung. Reprinted courtesy of Harper Perennial, an imprint of HarperCollins Publishers. “Daughter,” my grandmother called me, her hand reaching out. “Did you bring me a grandchild?” “Amah,” Grandmother, I addressed her in Chinese, taking her hand. At ninety-four, my maternal amah had lived to see five of her children bring thirty-one grandchildren into the world. But Amah was a greedy woman when it came to her family. Whenever I visited from America, she would pat and pinch my bottom, telling me it was plump enough to bear her seven great-grandchildren. Even though her grandchildren had already extended the family line with forty-two great-grandchildren, she wanted more. So on this visit, my tenth or so trip in five years, Amah again pressured me. She giggled, rocking back and forth in her wheelchair. I took Amah’s hands. Her skin was soft, cool. It was January in Cambodia, our cool season, when temperatures often wavered between sixty and eighty degrees Fahrenheit, perfect for my Cambodian-American skin. But for native Cambodians, the Khmers, sixty degrees was cold. Earlier that morning, I saw our neighbor leave his house, cursing the chill and morning dew. He wore two layers of sweaters, a red wool hat, and black socks under his open-toed sandals. A woman holding a toddler followed behind him, both bundled in scarves and heavy coats. “A-moy,” little daughter, Amah said, pulling me closer to her. In our family, we spoke both Khmer and Chinese, and often switched between the languages depending on with whom we were conversing. With Amah, who came from China, we spoke Chinese. I leaned in, squeezing her hand lightly. “I’m here,” I told her. My family’s village sits on the outskirts of Phnom Penh, Cambodia’s capital and largest city, where over 1.5 million people make up the hustle and bustle of big-city life. Our village is a two hours’ drive from the city and houses five hundred families, equaling around three thousand people. Only two hours away, but a life as different as day and night. In the city, they have electric lights, paved roads, cars, hospitals, high schools, movie theaters, tall buildings, and, in one shopping mall, mechanical moving stairs. My family told me this with the delight of rural people discovering their country for the first time, which in many ways, they were. For in the village, they lived by the light of the sun and the moon, grew their own food, slept in wood homes, and walked on winding, red dirt roads. I turned my gaze from Amah to the small, wooden cow wagon pulling young students in white and blue uniforms on their way to school. They sat crouching, body to body, their eyes not yet alert. A row of boys sat in the front with their feet dangling in the air, their toes pinching their sandals tight on their feet. In the midst of the boys, a lone girl sat leaning against the edge, her white shirt tattered but clean, and her blue skirt falling past her shins. She turned to me and waved. Probably to many in the world, this patch of earth was just another village among many small, dusty villages. And at first glance, like many small villages, it looked impoverished, crowded, and populated with thatched roof huts built on wooden stilts. But if visitors were to stay, if they learned to navigate around half-naked toddlers, squawking chickens, wandering pigs, and barking dogs to our psah, our outdoor market, and meet the people who called this place home, they would change their minds. In our psah, from 6 a.m. until 6 p.m., local Khmers shopped, bartered, argued, laughed, and ate. There you could still buy a bowl of steaming noodles for five hundred Khmer riels, twelve American cents, and have it served with a spoonful of local gossip or a ghost story. The vendors, farmers, butchers, fishermen, flower pickers, clockmakers, and motor repairers were sometimes friends, often family, a community of souls who had suffered together, and were now surviving and thriving. For all these reasons, the village felt like home, even though I’d lived in America ten years longer than in Cambodia. I keep returning to this community, my roots, and the place of my birth. This land, measuring only 69,898 square miles, is roughly the size of Washington State in America, and small compared to other countries I’ve visited. But like its people, what it lacks in size, it more than makes up for in heart and rich history. In this nation of around fifteen million people, 90 percent are ethnic Cambodians—or Khmers, as they call themselves—with an assortment of other groups making up the rest of the population: Vietnamese, Thai, hill tribes, Chinese, and a mosaic of newly arrived Westerners. Cambodia’s story is diverse and fascinating. With its first national election held in 1993, modern Cambodia, which had existed for two thousand years under royal rule, was by 2000 still in its infancy as a parliamentary democracy. “Daughter . . .” Amah called me back. I returned to my grandmother, stared at her transparent skin covering thin blue veins like dewy sheets of rice paper. Gently, I stroked her palm, her knuckles, the length of her fingers, the tips of her opaque nails. And as I gazed at Amah’s face, I understood that for me, Cambodia would always be about family. For this reason I looked forward to coming home, despite the exhausting twenty-five-hour-plus flights, the jetlag, and the keeping up of dual lives as both a daughter and a human rights activist. It was all worth it for moments like this with my family, my sister, my amah. “Where’s my great-grandchild?” Amah prodded. I laughed. It was due to such grandmotherly insistence that Cambodia had grown from five million people in 1975 to twelve million in 2000. “How can I have children if I am not married?” I countered. She sighed, making the sound of a small wispy willow rustling in the wind as she pondered this. “True,” she said. As much as Amah wanted to populate the world with her family, she was still traditional and believed in marriage before children. I hoped this would end her “baby” talk—for the next hour anyway. Still, I waited; I knew my amah wasn’t done yet. Eighty pounds, withered, and wrinkled, Amah was the matriarch of the Ung clan, and with this title she wielded the formidable power to coerce all her descendants to reproduce. A lot. Everywhere. The Ungs had already taken over the village, but if Amah had her way, next we would take over Cambodia. And then the world. “Amah, I brought you a gift,” I said, changing the subject. Her face lit up. “Did you bring me what I asked for?” she asked, struggling to sit up straight. In a country where life expectancy is roughly sixty-one years for women and fifty-seven years for men, Amah had outlived all of her friends, many of her children, and a few of her grandchildren. In the village she was celebrated as Amah chiem la-awe, a grandmother who possessed good blood. Amah attributed her health to a shot of Hennessy a day. Whenever she had visitors, Amah didn’t ask for gold bracelets, moon cakes, or ripe mangos, just a bottle of Hennessy. The real stuff, not the imitations. For a woman who could not speak, read, or write English, Amah knew how to draw the letter H perfectly. I handed her the bottle I brought from America. “Hennessy,” Amah eyed the decorated H on the bottle, nodding her head in approval. “Hennessy keeps me warm and living a long time,” she chuckled, her gnarled fingers working like claws to unscrew the bottle’s top. I took the bottle from her. My four aunties had given me strict instructions not to give Amah a drink. They had worked out a schedule to regulate Amah’s shots to one for lunch, and, if she was having trouble sleeping at night, perhaps another before bedtime. I put the bottle on the table in the corner of the room—out of her reach and sight. My demanding amah was back. “But,” I began to argue, but Amah was not listening. Instead, she pointed to a framed black-and-white picture of her younger self hanging on the wooden wall. “Very pretty,” I agreed, nodding my head. I imagined she had just traveled back in time. Perhaps to a period when her hair was as lustrous as black silk and flowed past her waist, when her teeth were made of white pearls and her skin was as smooth and soft as a baby’s bottom. Perhaps she was with grandfather now, reliving a private ribald moment. I was filled with admiration for the tiny woman beside me, a woman who had survived nine decades of poverty, war, and loss, and yet was still full of life. “But I’m no—” I stopped myself. There was no use arguing with her. In Cambodia—where girls often marry at sixteen, seventeen, or eighteen—at thirty years old, I was old. It did not matter that I was educated, had a job, and looked young. In the village, it was all about numbers, and the number thirty was old, but old was bad only if you were unmarried. By my age, my sister Chou was not only married, but had given birth to five children. Now, at thirty-three, she was respected in the village as a woman, wife, and mother. Suddenly, my boyfriend Mark’s face floated before me, his eyes the color of a blue ocean, and all of a sudden, I was back in America with him. Marry me . . . In the moment of his proposal, I’d transformed into Rebecca of York, the beautiful healer in Sir Walter Scott’s Ivanhoe. My first big book, I read it when I was a romantically impressionable fifteen-year-old. In the novel, Ivanhoe is torn between two women: the dark-haired, worldly Rebecca and the blond, chaste Lady Rowena. Ivanhoe’s choice of the boring Rowena over the warrioress Rebecca tormented me for months. If a powerful, exotic woman skilled with a sword and healing couldn’t win the man she desired, what chance did the rest of us brown, slightly height-challenged, double-jointed girls have of winning the man of our dreams? But there I was, and my Ivanhoe had chosen Rebecca. I stood on my tiptoes and wrapped my arms around Mark’s neck, my face resting above his heart. I could hear it beating. You are so precious to me . . . When my Ivanhoe raised my hands to his lips, my body lifted off the ground toward the sky. Soon, I was with the stars above the world. In the night sky, fireworks exploded into colorful bursts. Yes! I wanted to tell him. Yes, yes, yes! But suddenly the fireworks stopped, and the sky split open. Like a curtain, cosmic particles that separated my worlds parted, and from behind them, the soldiers appeared. One by one, they amassed, their eyes gleaming. They did not stop arriving until they’d formed an army. Then as a black, swirling mass, they flew after me, their dark shirts and pants flapping in the wind like angels of death, leaving trails of horror, mass graves, and tears in their wake. Slowly, I descended to earth, my elation infused with fear. When I landed, I was still with Mark, his arms encircling me. I struggled for my breath. In that moment, I knew I had to leave. “Amah, how do I know this in a man?” I asked, my voice barely a whisper. 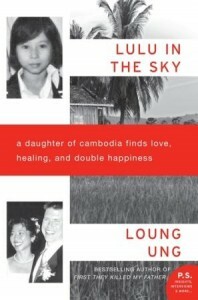 The above is an excerpt from the book Lulu in the Sky: A Daughter of Cambodia Finds Love, Healing, and Double Happiness by Loung Ung. Copyright (c) 2012 by Loung Ung. Reprinted courtesy of Harper Perennial, an imprint of HarperCollins Publishers.